computers or syncing your Android mobiles with your computers. 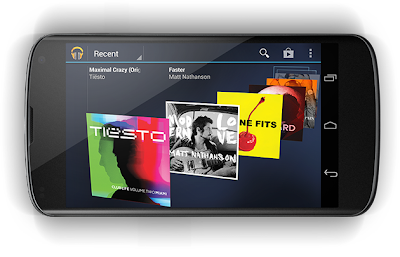 Android Market, Google Music and the Google eBookstore will become part of Google Play. In coming days Android Market app will be replaced by "Google Play Store." There are hundreds of free songs and millions more to buy on Google Play. The music you choose is automatically stored in your Google Play music library and instantly ready to play on your computer, Android phone or tablet. You can access your Google Play music library anytime, anywhere - without the need of syncing it with your computer, android phone or wires. Even if you are not online, you have a choice of pinning up your favorites on your mobile for offline playback. All your books are stored in the cloud, so your entire library is always with you, accessible from any connected device. And with offline reading, it’s never been simpler to dive into your favorite books when you are offline, out of range, or in the air. Start reading on your tablet, continue on the web, and finish that chapter on your phone. You’ll pick up the story just where you left off, always on the right page. With Google Play you can rent movies and watch them instantly. Alternatively, you can download any movie for offline viewing and view it later using the Google Play Movies app or watch it directly on the Web. but right now all services of google play are not available in all the countries.